Updates in 2012 from Chris O. 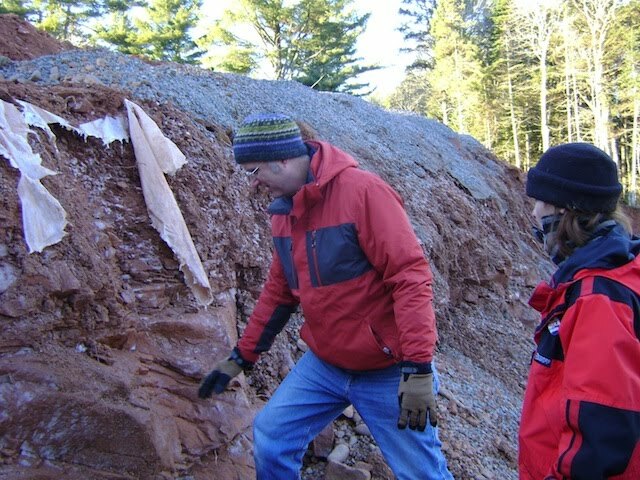 Also, it is very likely that the crews are encountering a quantity of bedrock in either the Churchill section (west of Crawford's Brook, that being the former UPEI land near where Plan B will rejoin the existing TCH approaching Strathgartney) or the Bonshaw section (western edge of the project). This amount of bedrock close to the surface is NOT surprising and is mentioned in any geologic description of the area, but not something that these Plan B planners obviously thought about. Well, this goes back to Plan B being announced less than three weeks after the comments period for the three original Gateway plans closed a year ago, so if you plan a major project in three weeks...you may miss details...like Old Growth Hemlock, springs and seeps, and the nearness to the surface of bedrock deposits....but I digress. Because the rock is costing money in equipment, we have heard they will just have to turn to explosives. Blasting might involve bringing in folks from Nova Scotia, where there are more companies with workers who have experience in blasting *granite*. How often do people have to blast sandstone on a dear little sandbar where everyone is dependent on groundwater? And right near a major broadcasting tower? And what will this cost? We've already heard that the *teeth* on the excavators need to be replaced weekly at a cost of about $10,000 (lots of numbers flying through the air). Folks, we need to ask government these questions and get answers. They have been quite quiet on if they are staying on budget, with all the increased costs of mitigation and the excavation that are *certainly* not covered by the Gateway money. All the feel-good articles soaking us like the dew are not addressing explosives and costs. This is the bucket of one of the excavators sitting along the highway in Bonshaw. It's missing its fifth tooth (on the right), and the other teeth are quite worn. The teeth are frequently replaced for more efficient digging, but you can guess that costs. Q (Wayne Thibodeau): How surprised were you by the Opposition you faced to the expansion of the Trans-Canada Highway west of Cornwall, a project that soon became known as “Plan B”? A (Robert Ghiz): Quite surprised would be an honest answer. It’s been known the Trans-Canada Highway in Prince Edward Island is not up to national standards. The first route that we had chosen went through Strathgartney. I’ll be honest, when we first heard that I didn’t think it was a good idea. When the engineers came in and explained it to us — that we were actually going to enhance certain areas of the park and expand certain areas of the park — that made more sense. Going to public consultations, we heard loud and clear people did not want Strathgartney messed with. I can relate to that. We listened to what the public said. One can always slant other people's words, including that of former Party Leaders, but I suspect no one (except perhaps the editorial writer) who made those comments would have made them if he or she had seen the maps and or had foreseen the implications. Q: But that praise didn’t last too long did it Mr. Ghiz? A: There’s always going to be individuals that disagree. The part that I find disappointing is people saying we didn’t listen to them. We did listen. We moved it. But I will say this, the people that are protesting have made government think long and hard about this. It’s not changing our mind but is it going to make us look at things from a more environmentally-friendly manner going into the future? Yes it will. OK, well, I can't say anything that isn't sarcastic to that. In today's paper, Ryan Ross lets Steve Yeo promote the great job they have done in the Hemlock Grove. Please, do not read on an empty stomach, or perhaps even on a full one. The biggest of several misstatements is that work on Plan B is pretty much done for the winter. Mr. Ross needed to walk a few metres west to see the box culvert half installed in Crawford's Brook, and perhaps be reminded that there wasn't much a story done on the rains of December 11 or 22rd that flooded the dams or the Peter's Road on this side of the project. “Whatever needs to be done work has stopped and if things need to be corrected or adjusted, certainly that’s a priority on a daily basis,” he said. "Vessey said the department and contractor’s staff have been doing good work under sometimes difficult circumstances as the project progresses. 'They continue to work on the project with the environment on the forefront of everyone’s mind, as it should be,' he said." It's like some sort of amalgamation of the Grinch and Pinocchio. This is our $10 million view of Churchill. Personally, I liked it better when all I could see was trees. It's looking east from the slope that used to be the maple and birch grove on the Crawford's property, down into Crawford's Brook, across Peter's Road (by the right-hand bulldozer), Hemlock Grove (a dip out of sight), with the current highway at the top of the road cut. That's more than enough for today. Thanks for reading. Be careful on the roads tonight. Peter's Road in Churchill, facing north; Camp would be at top of road to right. The worst of the lake drained over the next 40 hours of so. Media: Friday's CBC Radio Political Panel is not yet archived, but it was basically Nancy Key giving the Plan B opposition her "Nice" award for being one of the best things of the year. I'll post the link as soon as I can find it. Guardian: Saturday's paper had an editorial on the Bonshaw Hills Committee, which was formed to meet one of 11 conditions that Minister Sherry exacted upon Minister Vessey for approval of the Plan B project. The conditions are attached as a pdf. The land management is number 9. Number 3 is just as important, no? It is OK, in that typical alternating fawning and finger-wagging style that some of their editorials have. And, right next to it, is this letter from Tony Reddin, who has the honor of writing the first published letter a year ago. First, on the media front, it sounds like on CBC Radio's "political panel" this morning (7:40 - 8AM), Plan B is going to be mentioned a bit by Nancy Key, the Summerside lawyer who has repeatedly, repeatedly spoken against Plan B. Second, it was great to hear that so many checked in with the Gateway@gov.pe.ca folks to lodge a complaint. On the morning of December 11, 2012, Departmental staff met onsite with the contractor and regulators from the Department of Environment, Labour, and Justice, as well as the Department of Fisheries and Oceans. All areas of the construction limits were visited, issues were identified and prioritized. The higher priority issues were addressed immediately, while other issues were addressed within 24 or 48 hours. All issues were dealt in accordance with the various regulatory approvals issued for this project, and to the satisfaction of the appropriate regulators. Environmental effects monitoring continues. Compliance monitoring continues on a daily basis. Anyway, we can respond to that prerecorded announcement as individuals -- it's not good enough: Sherry's conditions state that "work must cease" and that *certainly* did not happen in Crawford's Stream. Well, there is more rain forecast, so there are some stalwart volunteers with cameras and sampling bottles getting ready. Anyone interested is encouraged to come out around the sites today or tomorrow. Contact me if you want better directions on where to park and where to go. Have a good day...very best of wishes to all of you. One year ago, TIR Minister Vessey surprised a lot of us by announcing Plan B. Islanders were originally told it would not be until January, and of course we thought the Gateway money would only be for either Tryon, Crapaud or Strathgartney. Not that all the money being spend on a huge new plan cutting north into the Bonshaw Hills. Tomorrow (Friday) I am sending a recap of the last year, but today we are asking for a little request. As you know, the Complaint Management System is our only avenue to send concerns, lodge complaints, or ask questions. Though a lot of weight is placed on it in the Environmental Protection Plan (EPP -- which was part of the "Environmental Impact Assessment"- EIA), and Environment Minister Sherry bases her conditional approval of Plan B on Transportation adhering to the the EIA, most of us who have written or called in any sort of concern have been answered in a cursory fashion (which has left us cursing), if at all. SO, you may remember that one week ago there were several breaches of the environmental sediment containment designs along Crawford's Brook (west of Peter's Road) and Crawford's Stream (the Hemock Grove, east of Peter's Road). At the Brook, there was massive overflow and attention was focused on draining the brook bed. Sediment was definitely getting into the tributary. At the Stream, sediment rich water flowed down from the parking lot/new south Peter's Road, right by the collapsed silt fence, and into the Stream and off to the West River. Work continued on the culvert arch placement that day on the Stream. A little complaint from a lot of people may remind the Ministers that they must "comply with their compliance strategy." **Please spend a few minutes packaging and sending a letter, as you anniversary tribute to a year of Plan B. ** Thank you. A sample letter and addresses will come in the next e-mail. Please personalize and embellish all you wish, or just send it. It's knowing that Islanders are still paying attention that is important here. Fantastic Talk in Bonshaw Tuesday evening with Scott Rice-Snow, hydro-geologist! Over 50 people attended, and learned *a lot * about how groundwater flows. One can conclude that Plan B was NOT well thought out when it came to hydrology (among other things), and that everything they are doing now in the Crawford's Brook and Stream is *reaction* to problems they have uncovered by not understanding normal patterns of waterflow in a watershed. There’s more, but you get the idea. These selections are true to the whole of his press release. For Thursday -- how you can commemorate Plan B's first anniversary. and some discussion after his presentation. additional thanks to Shona and Matt, with proceeds going to Stop Plan B. It's a week when everyone has plenty of fun things to do at home and with friends and family, and there are a few Plan B bits of news to relate. First is a reminder about the Groundwater and Plan B talk tomorrow night (Tuesday), at the Bonshaw Community Centre, at 7PM, with Ball State University geology professor Dr. Scott Rice-Snow. It should be a timely presentation, as far as Plan B goes, and we are fortunate to have Scott speak before he heads back to Indiana. Scott Rice-Snow checks out seeping groundwater on the west bank of Crawford's Stream (in Hemlock Grove -- you can see the pines and other trees above or to the north in the photo), with public monitor Cindy Richards, last week. The plastic at the upper left is from an attempt to capture water in the layer above. Thursday is the one-year mark of the announcement of Plan B. It would be good to see some letters referring to that in the local papers. A special thanks is extended to all those who attended any of the question periods at the Legislature for this Fall's sitting. Though there were many issues going on, the fact that people opposed to Plan B kept a presence there made an impact. I would like to know why Environment Minister Janice Sherry did not stop work on the Plan B TCH project on Dec. 11 when it was discovered that mitigations put in place to reduce damage to the environment had failed in areas where work was ongoing? Is it because in her department money and time constraints trump environmental protections? Is it because there was some fine print in the conditional approval, that none of us could read, that said ‘when time and money become an issue, all the other conditions are null and void’? I was on the work site on Dec. 11 with other public monitors while the water ran red, while silt/sediment poured from the work site into the watercourses, while mitigations failed, while failed mitigations were ignored and work continued. The public is not ignorant. We do understand that the conditions Minister Sherry put in place in order for this TCH project to go head were ignored. She knew public concern for this project would be high and knew we were watching. Dec. 11 was not only a test of the mitigations, it was a test of the minister’s conditional approval. A test which she failed. I would like to know if Minister Sherry gave approval for work to continue on the site on Dec. 11 at the expense of repairing mitigations? I would like to ask her to address the public and explain why her conditions were ignored? I would like to ask her to explain to the public why they should still trust anything she says regarding this project or future projects? Have a great weekend! Don't forget the Coro Dolce Christmas concert at the Bonshaw Hall Sunday at 2:30PM. Through the application of a great deal of heavy equipment and manpower, the worst issues at the Crawford's Brook area have been addressed. Yesterday, Dr. Scott Rice-Snow, visiting hydrology professor from Ball State University in Indiana, visited the Plan B info centre and looked at maps, saw the western worksite in the Bonshaw region (that's visible from Green Road), and walked around the Crawford's Brook and Stream sections with campers Cindy and Janet guiding. It's pretty obvious he understands the foolishness of trying to contain these waterways. He has offered to give a talk on some basics of groundwater and specifically related to the Plan B area early NEXT week, as he is giving his two research talks today at UPEI (info on those below). This is really timely, and really kind of Scott, since he is only here until Christmas. Right now that Plan B hydrology talk will be either Monday or Tuesday evening (December 17 or 18th) at the Bonshaw Community Centre. Thursday, December 13, in the Faculty Lounge of UPEI, Main Building, 12–1 pm. Scott Rice-Snow, visiting professor to Island Studies from Ball State University in Indiana, has been on PEI this fall researching the geometry of PEI drainage basins, and will summarize his results to date at a lunch-and-learn session. Scott Rice-Snow, visiting professor to Island Studies from Ball State University in Indiana, will make a public presentation Thursday evening, December 13, on a topic that is increasingly relevant to PEI: protecting high-quality groundwater from petroleum development. Dr. Rice-Snow will discuss his research on this topic, gained from studying landscape and aquifer interactions near Carlsbad, New Mexico. The presentation and discussion will be in the Faculty Lounge in Main Building, UPEI, beginning at 7 pm. The concert will include John Rutter's Brother Heinrich's Christmas, a whimsical retelling of the origin of the carol In dulce jubilo, narrated by Terry Pratt and a singing donkey. The Hall is going to be affected by the as-yet-untold plans for Plan B through the village of Bonshaw, and the choir master and many in the group have been vocal opponents of any massive projects (Plan A or B!). Yesterday's rain causing massive sediment at two locations along the Plan B site was very hard to watch....and totally expected. The first was noticed at "Crawford's Brook", which is west of Peter's Road and is the steep-sloped maple grove. A large, long (500 ft.) "box-culvert" (a square concrete hollow tube) is to be placed there so the brook can be filled over for the road. They are "dewatering" the brook by means of two dams and a pipe in between, and of course all the water from the rain and other watercourses that feed that brook filled up the area with brown goopy water, about the size of a rink. So they pumped it out uphill, but it ran right back in, all flowing into the West River in Churchill. 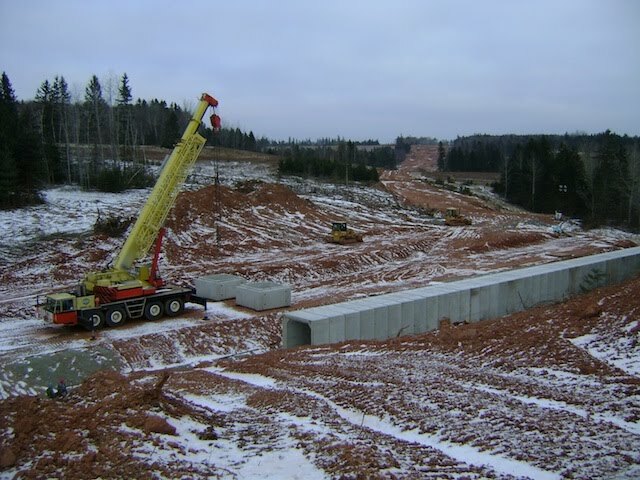 The second was at Hemlock Grove, Crawford's Stream, were the concrete arches are being placed to be a very long culvert. At the downstream end of the culvert, runoff and groundwater filled the arches way up. This was pumped out, but a silt fence on the eastern side of the stream, downstream of the arches, which served to hold back run-off from the hillside with the parking area and what will be South Peter's Road, was overwhelmed and squashed by the water. Even after this was pointed out to the construction manager and transportation environment officials and the Department of Environment representative, work resumed on placing the arches. Crawford's Stream, eastern bank, downstream of the arches (white lump in upper left). This was in Direct Contravention of Minister Janice Sherry's conditional approval of the Environmental Impact Assessment of October 1st of Plan B. "3. TIR shall, in the event that sediment associated with the construction project enters a watercourse, immediately cease operations in the affected area and implement measures to divert sediment from entering the watercourse." Clearly, Condition Number 3 was ignored by the Transportation staff, the contractors, and the environment representatives. It really would not have taken *that long* to fix that silt fence. Such bald-faced refusal to acknowledge and follow a condition of the agreement is reprehensible and perhaps shows the lack of ethics of the long, sorry chain of command of this project from the decision-making people on site all the way to the Premier. Compass's so-so coverage was at 4:20 into the broadcast last night. 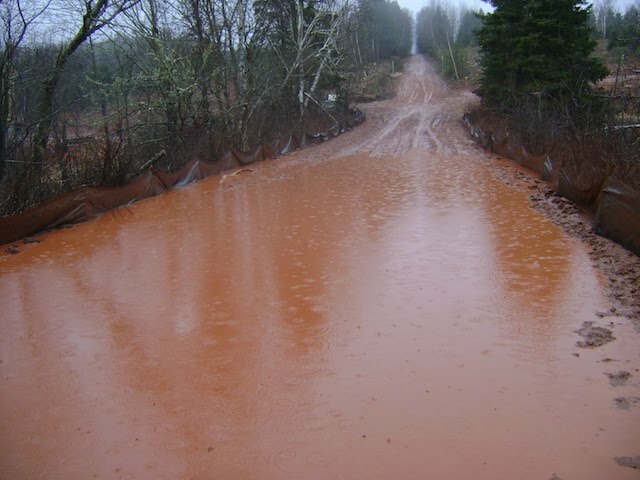 Cindy just reported that last night's rain has burst the earthen berm placed at Crawford's Brook (that's west of Hemlock Grove, the area of the beautiful maple grove west of Peter's Road). All the authorities and some media have been contacted, water samples taken, etc. This is sadly expected -- the berm to "dewater" that lovely little brook was quite full *before* the rain yesterday. The other sites have or will soon be checked by the volunteer public monitors. Photos when the light gets better. So much technology, so little wisdom. Building roads to nowhere while the Island sinks further into debt. Hello, Everyone,Here is the link to Santa's chat with Premier Ghiz on Friday. The Plan B Information Centre is open Tuesday, December 11th, from 1 - 3 PM, in the lower level of the Bonshaw Community Centre. Come by to see the maps! Apparently today and for the next two days, the gigantic arches will will make up the culvert in the old Hemlock Grove will be installed. These are being put on the footings installed in the last two weeks, all on very soft ground that the groundwater keeps wanting to seep through, despite efforts at "dewatering". I am not sure how today's snowy/freezing rain weather will affect placement, but I do know the Watch Plan B public monitors (just volunteers like you and I) will be keeping an eye on the waterways for sediment run-off with the rain forecast. The invisible line that marked the construction zone (once they removed the snow fence) has dissolved. The aggressive security presence has evaporated (except for the very nice individuals hired to watch the crane at night) and residents wishing to witness some of this can come and watch things from any perspective where they are comfortable from the western side of Hemlock Grove. Folks at Base Camp will show where you can go. If you are heading towards the Camp on Peter's Road, keep in mind the road may be soft; but parking along the TCH around there is still allowed, so you can head in up Peter's Road or on the ATV trail just west of Peter's Road but before the construction zone parking lot and what will be the third attempt at the connector between Plan B and the TCH (Peter's Road South). Scott Rice-Snow, visiting professor to Island Studies from Ball State University in Indiana, has been on PEI this fall researching the geometry of PEI drainage basins, and will summarize his results to date at a lunch-and-learn session next Thursday, December 13, in the Faculty Lounge, Main Building, 12–1 pm. Yesterday was a sunny, crisp day, and yet another example of how the government is being reminded that those opposed to Plan B are not going away. The Legislature closed, but not before the MLAs were greeted first thing by Santa, who had that special present for the Premier -- a framed print of Gary Loo's wooden artwork of the Plan B PEI Flag. Santa got his point across, though the Premier remained a good sport but a bit unfazed. Santa gives Premier Ghiz a framed photo of the "Plan B Flag" woodcut by Gary Loo, as other MLAs, folks and media people watch. There may be some better photos out there. Compass has a little clip on it at the beginning of their article about the Legislature closing on Friday's news. Gary Loo's original work has a temporary home at the Murphy Community Centre, with thanks to Mike Redmond for arranging that, so please drop in and see it when you are out and about in the next week or so. Some folks may be hiking around the Plan B areas this weekend, probably gathering at Base Camp around 11 or noon on Sunday. The Info Centre at the Bonshaw Community Centre will next be open on Tuesday from 1 - 3PM. On an mildly related community announcement, the Confed Centre is putting on "The Wizard of Oz" with a certain Catherine "ManyLastNames" as Auntie Em, and I will "caw" about how great she was in another untitled role. Other Plan B people have big roles behind the scenes. It plays this weekend and later next week. A fantastic production. Just because they are building it, doesn't make it right. CBC radio is doing a story this morning on the committee assigned by the Department of Transportation to enact one of Environment Minister Sherry's conditions for approval of the Plan B project -- preserving some of the land purchased for Plan B. There will be more to comment on later. 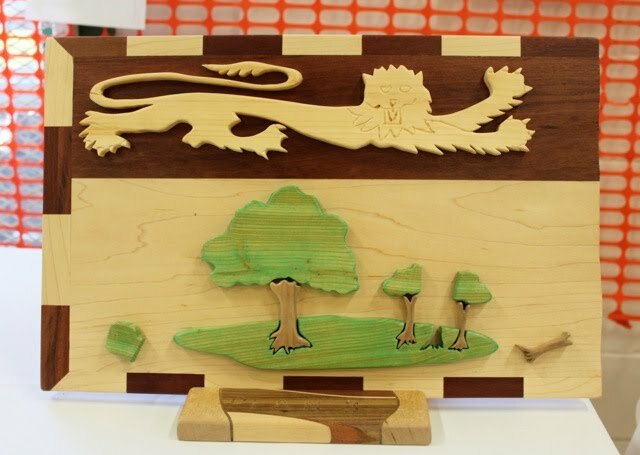 This is a photo of a woodcut version of the PEI Flag made by Island craftsman Gary Loo to comment on Plan B. The middle tree is missing -- chopped and pushed aside... symbolic of how thousands of trees, including rare and ancient Hemlock, have been mowed down to make way for the Plan B project. The flag is partially made of maple, spruce, birch, pine and larch -- trees felled by Plan B. The flag faces the opposite direction from how we normally see it, to symbolize the backward ideas of the plan B project, and the ragged right edge makes it appear that the flag has been ripped from the flagpole. The original is on display today at the Murphy Centre (tentatively) and will be displayed at other venues in the next few weeks. Perhaps wander out to Province House this morning, as the Legislature is probably going to close today or in the next week. CBC has commissioned a question about Plan B approval among the Island population, and planning on reporting the result and chatting with me and others -- sounds like it is after 8AM this morning (not sure, though). And it's official (! ): not many islanders support Plan B. Minister Vessey had a letter to the editor in Monday's paper, justifying the cost of land purchases for Plan B. And it sounds like there will be a big announcement by the Department of Transportation and Environment about the committee (The Bonshaw Hills Committee) that's figuring out what to do with a few parcels of undeveloped land that was bought for the highway. To the west off Peter's Road in Churchill, "grubbing" up the hillside. They are also working on the Hemlock Grove, trying to place those footings for the giant culvert arches. which is from yesterday while they are putting in footings despite water seepage from the springs/groundwater along the western edge of the Hemlock Grove. (At Hemlock Grove, looking down and east). If you are in town and able, Question Period is from about 2:20PM for almost an hour, and interesting to attend in some odd way. There are sure to be questions about the lengthening of the current provincial government's "mandate". It was a windy but nice time at the camp off Peter's Road this weekend (until you went down to the Hemlock Grove to see what was up). The construction people were continuing to hope they could drain the water from the area so they can install the "footings" and arches for the culvert over the stream, and then divert the stream back. It's still pretty wet, even without last night's rain, so we will see. It does sound like they are working on the area today, though. Feel free to stop by this week to the camp, and the Information Centre will be open at the Bonshaw Community Centre tomorrow (Tuesday) from 1 - 3PM, 25 Green Road. Current maps will be available, and Gary Loo's woodcut of the Flawed Flag will be on display. Here is one photo of what the Hemlock Grove looks like, taken by me yesterday of my daughter looking south or downstream. The pump is removing groundwater drainage that's seeping in from the western bank of the creek, the real creekbed has been scooped out and replaced with gravel, and water is seeping everywhere. Apologies for those of you who saw this on facebook already, but it's captures how misguided this project is, and what we are leaving for our children. You can click on the various images and photos to get to a "photo album" of pictures. We hope to have video available soon. At the Hemlock Grove, a crane is set to begin the culvert installation. Visitors to the Peter's Road camp can walk down and see what is going on. The Info Centre at the Bonshaw Community Centre will NOT be open today, but will be Tuesday, December 4th from 1-3PM. Would anyone be able to attend Question Period today? It is the one day this week that wasn't already picked by others. Just send me a quick note, and I can give you a short description of where to go. Basically, you need to be there from about 1:45PM to 3:15PM, at Province House, to watch Question Period from the Gallery, and watch out for any Plan B references. Lloyd Kerry's letter in yesterday's Guardian related the $15,000 that Buffaloland Provincial Park costs to run to the exorbitant costs of Plan B. The Guardian website is down at this moment, so I will send that link later. CBC's Brian Higgins visited Camp Vision yesterday -- we will see if it makes it to the air today. Thanks to Cindy and Larry for changing plans to head back to Camp to help out. Stop Plan B Info Centre -- 1 -3PM, Bonshaw Community Centre, 25 Green Road. The original woodcut of the Plan B PEI Flag by Gary Loo will be on display. This is a glossy 28 page document produced by the Department of the Environment that wants to help Islanders to be part of the process for insuring a healthy, sustainable future. When you consider that they are seeking public opinion, after how they treated public opinion during the Environmental Impact Assessment, I have to raise my eyebrows and shrug. But, perhaps it is a good time to write some simple truths to the the government about the environment, and government's treatment of it. Please forward this on. Note (the first few pages) with Premier Ghiz's and Minister Sherry's messages. How could they write such things, given Plan B?!! A rich source of quotes for future use. This joint effort of the Environment Advisory Council and the Land Use Policy Task Force aims to implement one of the recommendations of the Report of the Commission on Land and Local Governance: that the provincial government develop a new Conservation Strategy that builds on the 1994 version. As noted in the press release, comments are now being accepted. Yesterday, some of us went over some parts of Plan B where it seems likely that runoff will occur. There are four major areas: in Fairyland, at the Hemlock Grove, at "Crawford's Brook" (west of Peter's Road, the maple/birch ravine) and along the West River in Bonshaw. If you are interested in being a public monitor, and checking sites, especially during and after rains, let me know. Saturday also saw two other letters, but they are not available electronically yet. The Info Centre will be open this week from 1 - 3 on Tuesday at the Bonshaw Community Centre. Come by to see the maps and get an idea for what's going on before heading out to the sites. Yesterday's weather was just right for a workshop on winter camping! The notes from the session will be available on-line soon, and another session is likely to be offered in another month or two. Stop by the camp off Peter's Road to see how it can be done. And this week brings another week of our Provincial Legislature, where they either avoid Plan B questions altogether, or remarkably, still defend it for safety reasons. The Opposition members, to their credit, do bring it up, but haven't really followed up on the false justification of safety. If you would like to volunteer an hour or so to watch the Legislature's Question Period, please let me know. The folks down on the floor of the Legislature *do* note when there are people there concerned about Plan B. Yesterday we had a lesson in proper water sample collection technique for documenting construction site run-off into the tributaries of the West River. This is something volunteers, citizen monitors, are planning to do as part of Watching Plan B, as sediment in the waterways is a huge concern. Interested people are always welcome -- let me know. starts at Bonshaw Community Centre, ends at Base Camp -- a must for anyone thinking of staying there for a bit of time, or just interested in the suject and supporting keeping an eye on the Plan B sites. Tarps, bungee cords, bags of leaves or other good banking ideas, outhouse lime, a cheap, minimal way of getting internet connection, wood, candles - the long ones and pillar candles give the best heat, Coleman lantern and stove propane tanks, drippable coffee - then we can make our own, very large garbage bags, etc. I am wondering where all the wood is going that is being cut on the Plan B. Project site in Bonshaw? I hope that the wood is not is going to the contractor/contractors that are working on the site. There are many poor people in this province that can use this wood. I suggest that the wood be given to people on social assistance and those people living below the poverty line that use wood for heat and cooking purposes. There are hundreds of cords of wood suitable for firewood that has been clear-cut in the Plan B project area. The larger trees that have been cut, should be milled and given to the Habitat for Humanity, and to people who have problem to come up with enough resources to build their first home. Since the wood is being cut on Crown land, then the poor people should have a chance to get some for heating and cooking purposes. This morning, CBC Radio is having a phone in on HST. If you wish to call and make a connection between the lack of consultation for both the HST and Plan B government decisions, please do. 629-6461, between 7 - 8AM. Please join a few of your Plan B friends to lean over the Gallery Rail and watch Question Period of the Legislative Aseembly (today at 2PM and Friday at 10AM), or next week. So several months ago, I found myself attending meetings to learn about Plan B. A couple months ago I found myself standing at Province House with a sign 'Stop Plan B'. Several weeks ago, I found myself camping in the Hemlock ravine on the Plan B site. And last weekend, I found myself learning about the mitigations put in place to ensure that the small waterways crossing the Plan B site that feed larger waterways are not clogged with silt. It turns out that silt and sediment is a big deal and that 'a little murky water' is more than just something to notice. Silt and sediment in the waterways occurs naturally. It's when this occurs unnaturally that there is a problem. No, wait, it's when it occurs unnaturally and no one cares, that there is a problem. Basically all the parts of the ecosystem within a waterway are affected. Google it, there are lots of great articles that are easy to read and easy to understand. Hearing the lead engineer on the Plan B project refer to the failing of mitigations put in place to protect waterways from silt/sediment as 'a small event' is very disheartening. It means not only his value of the waterways is very low, but also that he suspects the public will not care. And he knows that not only does the public have to be educated about issues like silt, they would have to go out of their way to find out if silt is actually a problem on the Plan B site. So now apparently I will have to find myself locating all the small waterways on the Plan B site and learning how to sample water. Just a reminder that the Info Centre at the Bonshaw Community Centre is open today from 1 - 3PM, at 25 Green Road. Come by and check out some maps before heading to Peter's Road to see what is up at Camp. The Legislature is also open Tues/Wed/Thurs with Question Period after 2PM, and Friday at 10AM. It's an interesting way to spend an hour, seeing the type of government discourse that defends Plan B among other decisions. And there is plenty up at the Base Camp, with a trailer and structures getting ready for winter, for monitoring the construction and the "mitigation" efforts. Last weekend, I had the opportunity to go in a small plane above the Plan B site, with my son Paul, who has been analyzing the maps since Plan B was announced, and photographer Perry Williams. It was both gorgeous to see our pretty little sandbar of fields and woods, but nauseating to see the Plan B slash through the Bonshaw Hills. There is a video in the works, and I am getting still shots up on the website. The flyover was also a chance to evaluate the extensive shale pits in the area. Pretty ugly. The whole flight and photography idea was thought of and the gift of Cathy Grant and Paul Price, and their pilot friend Steve McCarthy of Nova Scotia. Countless thanks. It might be worth noting in letters to them. If you have time Tuesday, Wednesday or Thursday from 2-3PM, or Friday from 10-11AM this week, please let me know. It is amazing for juvenile our elected officials behave, but perhaps a sobering reminder that we haven't forgotten Plan B. They have altered the stream at the hemlocks -- yes, it looks pretty ugly. And yet another design for connecting Plan B through a south spur of Peter's Road to what will be the old TCH has been issued. Presumably this goes through less wetland. It is the fourth-to-last link on this page. There is a link to the justification letter/addendum to the EIA on the same page. Stantec is still justifying the project will have improved benefits for safety. Info centre will be open Tuesday, 1-3PM at the Bonshaw Community Centre -- come in and see maps before heading to the camp. Dr. David Suzuki, at the Symons lecture yesterday at the Confederation Centre of the Arts yesterday, came and charmed everyone in the audience at the Confed Centre, except perhaps Premier Ghiz, who was told our whole way of measuring what's important (current economic indicators) was absolutely wrong. Don't tell me that so we can drive a little more "safely", we are going to devastate forest -- I mean that doesn't make sense to me! We have got to learn to live within much stricter confines." and it is about 10minutes into the broadcast. Today is the hemlock and other native tree planting in South Milton -- near Winsloe/Miltonvale Park/Sleepy Hollow area -- 2PM, dress for being outdoors and helping plant trees! This is sponsored by MacPhail Woods Ecological Forestry Project and the Island Nature Trust. increased awareness and concern for the future of this majestic tree. This planting isn’t meant to mitigate or offset the cutting in any way – that would take over two hundred years. Instead, the planting builds on recent increased interest in the species, in our native forests, and associated wildlife such as owls and salamanders. As in my brother's bonsai forest. Of this intertwining of real roots. And I slow a little when blinking away tears. In this fall foliage of gold & quivering red. I'm heading to where the trees will soon be dead. Because politicians want a road that no one needs. Fortunately, the rains from Wednesday did not cause a lot of run-off, since they were fairly steady; but some wonderful people are functioning as Public Monitors and checking areas that aren't visible from the road, and are on stand-by. Anyone interested in helping with this can contact me. David Suzuki - Live Streamed from Confederation Ctr. Date: Friday, November 16, 2012 at 12:30 p.m. Award-winning Canadian broadcaster, environmentalist, author and icon, Dr. David Suzuki, has been chosen to receive the Confederation Centre of the Arts' Symons Medal and give the 10th National Symons Lecture on the State of Canadian Confederation. Dr. Suzuki's lecture is entitled ‘Humankind as a Geological Force' and it will take place on Friday, November 16, 2012 at 12:30 p.m. in Confederation Centre's Homburg Theatre. The event is sold out. So, we will broadcast the event via Live Stream at the Farm Centre. With rain falling, there is the potential for run-off of all the exposed dirt into the streams around the Plan B site. There are folks from Camp Vision planning to check things early this morning, and anyone else is welcome to check things, too. You could cc to me, or let me know what's going on and I can send in the complaint. Also, please note that Camp Vision could use 1 litre water bottles for water sample collection for sediment. Any donation of the bottles (they could use the water, first) would be appreciated. Rally: The Rally for Responsible Government was Monday afternoon, and was an excellent event. Well over 200 people were there, a great turnout considering it *was* a nice, warm holiday Monday and many other choices beckoned. The speakers were varied and had wonderful concise speeches generally focused on an alphabet soup issue (HST, Plan B, PNP, PR -Proportional Representation), and all-in-all the overarching themes were that people were sorely disappointed in how the elected majority government was behaving, and how Islanders need to stand UP and speak UP, or nothing is going to change. ; in fact, that Plan B is just the Beginning. It was also different and fun as no elected representatives spoke, but several were there in the crowd, paying attention; except folks who were in Cornwall trying to have some of the glow from Justin Trudeau reflect on them, too. People of all ages used chalk to write messages on the sidewalks, and many wrote messages for responsible government on paper leaves that will be sent to the Legislature. Media coverage will undoubted focus on the one attendee who wrote on a pillar of Province House, which the crowd was later asked to refrain from, and was kindly taken care of by a concierge as the rally was cleaning up. There are excellent messages on the walkways for our legislators to see as they walk in and out today for the Speech From the Throne. Legislature opening: Today's session is short and very formal -- the Speech from the Throne read by the Lt. Governor, Frank Lewis, lasts about an hour and then they all have tea at the Murphy Centre. Wednesday the schedule returns to its regular format of starting at 2PM and after welcoming comments from Members, there is Question Period (QP) for the better part of the hour. We thought it might be a nice idea if a couple of people opposed to Plan B attend on most days for Question Period. Nothing demonstrative (you are asked to be silent and not bring any phones or recording devices up there), but just watch Question Period and remind our MLAs we have not forgotten Plan B. The times people are needed are the weekdays when the day's session begins and they have QP, though it's interesting to stay for the rest of the afternoon, too, just not as theatrical. There are a few people able to go to this week's (but the more the merrier), but if you would like to sign on for a particular day for next week, let me know. You have to show up and find the line, which usually starts forming before 2PM, and heads up the steps to the third floor gallery. Usually you have to check in with the desk on the first floor -- you can sign in and put PLAN B! next to your name and District (we could make sure the Tories know whose in the crowd Watching Plan B that day) -- and drop off cameras, and then head for the stairs (they are very helpful, usually). Once you walk in the Gallery (a little after 2PM, after the MLAs are all settled and have their prayers and song), you can go left and sit facing the government side on the floor below, or the right to see the Opposition and Government Backbenchers. There is only so much space, so sometimes you have to wait for people to leave before you get admission. The "Watch Live" button is in the middle left of the screen (or the other choice is "Listen Live" if you have slow internet. You can also watch QP later in the day when they have it archived on-line. I am not sure if the Opposition is continuing their Island Voices questions, but will check that out. Info centre open today: 1 - 3PM, Bonshaw Community Centre -- it's a lovely day, drop by and see the big map before heading out to Peter's Road. 10: I wasn't paying attention when 'driver-ed' covered "steering". 9: It makes it faster to move my harvester from grove to grove. 8: Best darn stretch o' pavement my staff ever dreamed up. global warming thing...don't make me laugh! highways. I just know I can beat that! 5: It brings back fond memories of kicking protester a**. 4: I'm so excited about how much faster I'll be getting to that red light in Cornwall. 3: I just love to cruise on shale from my own pit. 2: Got a 351 hemi under the hood. Can't wait to see what this baby will do on a decent straightaway. 1: At last... PEI is just like Toronto! The big reminder is the Rally for Responsible Government today from 2 -4 PM at Province House. It looks like it is going to be lovely day, so please come down for as much time as you can spare from your holiday to be counted among Islanders wanting *much* better government decisions than what we have seen. Saturday was a very fine day, and started with the Voluntary Resource Centre's Breakfast honouring some individual volunteers on the island. I was humbled to be included in an amazing group of very hard-working, dedicated people from different walks of life, and thank The Environmental Coalition of PEI for their nomination. It was good for Plan B to be talked about as a bad government decision (and not just at an outside rally) and with a few government members in attendance. And ironic that the emcee was Andrew Sprague, who at least isn't paid by the Department of Transportation to be against Plan B anymore, (and I am sure was volunteering his time). Such is life on the island! Wow, what a wonderful time Saturday night at the Murphy's Community Centre for "A Fine Concert for Change." There was superb entertainment, from the two darling McNeely sisters to the Count and the Cuban Cocktail (and everything in between), with an awards ceremony for certain government individuals (who sadly did not show up! ), poetry, top-ten lists, and songs of lament and of hope. The suggestion was made to have an annual concert around this time of year -- an excellent idea! The Murphy Centre was great and we appreciated all the help from the staff (and hope they let us back next year). Our sound guy (Chris Knox) was superb. Thanks to the many wonderful people who planned the silent auction, got the place decorated, organized people to sit at the welcome table, sat at the welcome table, set-up and helped clean up, performed, or contributed items for the sale, bid and bought items, and of course to everyone who came out and enjoyed the evening. Besides raising money to help with legal and other expenses, the concert was a way to thank all of you who did anything and everything to help stop Plan B, and will keep speaking out, and watch for the next "Plan B" that comes along. It's been four weeks since the hemlocks and the rest of the forest were chopped down in the grove off Peter's Road. Yesterday, a rather ordinary rain caused a breach in the silt traps. My favourite line is from Engineer Stephen Yeo, who has become the department's spokesman, saying "We get a lot of rain around here." Perhaps he thought Hemlock Grove was a rainforest. But we also play -- the fundraising concert is tonight, with wonderful performers and fantastic silent auction items. It begins at 7PM at Murphy Centre at 200 Richmond Street. Admission by donation. Hope to see you there! Before that, just for something completely different, is the opportunity to be part of a protest to the Liberal politicians as they arrive for their big Party Fundraising Dinner. It is at the Delta, and people are meeting about 5PM around Water and Queen Streets. And please tell your friends and plan to attend the Rally, 2PM, at Province House on Monday, the holiday. It's our chance to join with other Islanders to remind our elected government that we want them to govern responsibly in this session of the provincial legislature. Have a great day! See you around this weekend! Voluntary Resource Council fundraising breakfast, 8:30AM, Murphy Centre. ECO-PEI nominated me for the Plan B work. Say Hello at the Liberal Fundraising Dinner with other Plan B friends, Delta Hotel, about 5:30PM. Jean Cretien will be the headliner at the dinner. "A Fine Concert for Change" that night, 7PM, Murphy Centre, fundraising for legal and other expenses, admission by donation. A fantastic line-up of talent. (Have a good Remembrance Day -- they fought for our freedom, and it is our job to maintain and nurture that freedom.) It is also a good day to hike near the Plan B areas, since the workers aren't there, and visit Camp Vision. The weather looks good! Rally for Responsible Government, 2-4PM, Province House. Despite Justin Trudeau being in Cornwall around then, it's important that many people attend to send a message to government, before the Legislature opens this week. Plan B, PNP, HST, dialysis, school promises, reproductive rights, rural "development", etc. The film that was shown at Cinema Politica Tuesday night was fabulous. A big thanks to them and ECO-PEI for hosting that and for donating the proceeds to Plan B. Keep your calendar open for the concert Saturday night and the Rally for Responsible Government Monday from 2 - 4PM. Another reason to come to the Concert (A Fine Concert for Change, this Saturday, 7PM, at the Murphy Centre) -- free movie coupons! The Folks from That's Entertainment and The PEI Jazz and Blues Festival have offered one free That's Entertainment rental per person -- thanks to the business and the organizer for that. As many of you know, David Suzuki (DS from now on) is giving the annual Symons Lecture next Friday, November 16th. Since the first of the year, we have tried several avenues to contact DS to alert him about Plan B. Obviously, as the preeminent Canadian environmentalist, having him say anything about Plan B would bring a lot of attention to it, and could have swayed our government. But, as they say, our appeals were fruitless. No one got any response except maybe automatic messages saying they'd get back to us in two weeks. So we did a little blitz-request a week or two ago. Well, OK, so that's the update there. Thanks to you all for writing him -- I know he is a fantastic person, and I wish he had "appointed deputies" who were easily reachable to stand up and speak out about problems like Plan B as he is less able to get involved in these issues. Today the Plan B Info Centre is open 1-3PM, Bonshaw Community Centre. Stop in and see some maps, and have a cup of tea, before or after you go visit Camp Vision and see the teepee almost completed! Movie "Taking Stock" tonight, Lecture Theatre C, at AVC (go to public doors on second floor, turn left). Admission by donation. All proceeds go to the Stop Plan B people. Rally for Responsible Government -- Monday, November 12, 2-4PM, Province House -- please tell people to come. It is meant for ALL islanders to send a message before the Legislature resumes. For Saturday's "A Fine Concert for Change", we could use people at the door, AND to help with decorating and setting up (afternoon or beforehand). In previous communications, MPs have distanced themselves from Plan B, saying the actual project chosen was a provincial matter. Even Wayne Easter said last month (though I did not see the article myself) that he was for Plan B, which just boggles my mind, considering how people went out of their way to communicate with him about their concerns. All the MPs have to do is drive along the TCH and see the destruction, the waste of money on a new road so close to the old, talk to some Islanders, and ask themselves, "Who is benefiting here?" Despite that, have a good day! Monday night (tonight) may mean a municipal election near you -- consider going and voting to make sure your council stays on top of things in your area! Tuesday afternoon the Plan B Info Centre will be open - come in for a cup of tea and see the big picture in maps, and see what you can safely visit. Tuesday night is a showing of the film "Taking Root", admission by donation, with all proceeds going to the Plan B costs. 7PM Lecture Theatre C, Vet College Thanks to ECOPEI and Cinema Politica for their generosity and planning. Saturday morning (November 10th) is the Voluntary Resource Centre Fundraising Breakfast, highlighting Island volunteers, including your very own Stop Plan B listkeeper. Tickets are $30 with half of that a tax receipt. Call the VRC for details (368-7337). It starts at 8:30AM at the Murphy Centre. Saturday night is "A Fine Concert for Change", also at the Murphy Centre. This will be a night of music, comic pieces, and storytelling to honour the efforts and creativity of those opposed to Plan B. And help us pay the bills. Musicians include Malcolm Stanley, Roy Johnstone, Margie Carmichael and Teresa Doyle, among others, and the bands The Groove Company, and The Count and the Cuban Cocktail. Catherine O'Brien and Doug Millington will be the emcees, worth the admission (by donation) alone. "Stop Plan B CDs" will also be available, and there will be a 50:50 draw, a silent auction, and a cash bar after 9PM. 2 - 4 PM, at Province House. While the Speech From the Throne is the *next* day, and the first day of business is Wednesday, this rally will highlight the ordinary citizens' wish, desire and demand for government that listens to us. Plan B is surely the Poster Child of this. Islanders from all walks of life are invited. Let's show our elected officials that we expect better. Elizabeth May of the Federal Green Party visits the Plan B site Friday afternoon. This morning: Green Party of Canada Leader Elizabeth May will speak on CBC Radio Island Morning about 7:15AM. Elizabeth May will visit the Plan B Base Camp(Camp Vision) tonight about 5:30PM. Everyone is welcome to drop by. There is some carpooling -- people leaving from Charlottetown (Voluntary Resource Centre, Prince Street) at 5PM, and folks are encouraged to meet at the Strathgartney Lookout at 5:20 to carpool from there (just to keep the traffic down a bit at the driveway of the camp). Elizabeth has been following Plan B for a while, and will probably speak to the press from the camp. The PEI Green Leadership Convention continues (9AM to 2PM), with panel discussions on water and land use issues; Plan B is at the heart of a lot of this. Megan Harris (West River Watershed Coordinator) and Dr. George McRobie (author on sustainable land use) will speak, Peter Bevan-Baker (incoming GP of PEI Leader) will outline his vision for the future, *and* there will be lunch. The public is welcome (admission at the door). Plan B Info Centre is open from 1-3PM, at the Bonshaw Community Centre, 25 Green Road. Stop in the downstairs room to see maps, have a cup of tea, and get directions to Camp Vision or other areas to see what is going on with Plan B.
Saturday, November 10th A Fine Concert for Change, 7 - 11PM, Murphy's Community Centre -- mark your calendars! Monday, November 12, 2012 Rally for Responsible Government -- new! On Monday, November 12th from 2-4pm at Province House, Islanders from all walks of life are invited to come together to raise their concerns about PEI government policies. There will be speakers, music, education, etc. Everyone welcome. In case of bad weather, the Rally will be held in Murphy's Community Centre. For more information, phone 675-2541 or 675-4093. ** this is on the holiday Monday so more people can make it, and it is the day before the PEI Legislature's Speech From the Throne (which is Tuesday). Irene Novaczek's guest opinion of Oct. 26 (‘Plan B: a price too high') and Gary Loo's letter to the editor (‘Being good stewards of this Island') on the following day would be excellent reading for the policymakers of our provincial government. But these pithy and thoughtful letters need to be read more than once and, as I often like to say, be meditated on. This is especially so of Irene Novaczek's thoughts. In fact, I would suggest that all deputy ministers, ministers and even our premier, meditate collectively on what she is saying. Certainly the behaviour, decisions and attitudes of government indicate that they just don't get it. What Prince Edward Island is really about is not in their hearts and souls, and I seriously wonder about what is in their minds. Plan B is now a done deal. All the efforts and even sacrifice of so many good people to change government's mind has changed nothing. But to those people I say, thank you for fighting the good fight for a noble cause. The collective awareness and thoughtfulness of nearly every Islander has been elevated. Our appreciation of this place has been enhanced. I certainly hope in November of 2015, Islanders show that they have not forgotten. and Dan Aiken of Warren Grove obliquely references Plan B as part of the Ghiz's government lack of courage. We got a reply from David Suzuki's office (with thanks to Judith Arnold for her determination in tracking down a living human being). Short answer: He's too tightly scheduled on this visit to stop by the site (I'll ask just where exactly he is going), but he will look at our letters and material and have his assistant Deanne write something back if he has anything to add, when he next is in the office. We were reminded to do all the things we are doing -- contact our elected officials, write the media, bring it to the attention of local governance, etc. She said that they have all the info they need and have asked that we stop writing. She explained how overwhelmed he is with all sorts of requests, which must be true because I know a lot of people have contacted the him over the last months and no one, as far as I know, got any sort of answer. I will post his guide called "Driven to Action" in the files. Thanks to all who wrote him. The Green Party of PEI convention is this Friday and Saturday at the Arts Guild, and all events are open to the public. Friday night (doors open at 6:30PM) includes a speech by Elizabeth May, MP and Federal Leader of the Green Party, Erskine Smith and Todd MacLean. Dr. George McRobie (author of An Island Future: Towards Sustainability and Self-Reliance). I suspect Plan B may come up once or twice both days. "A Fine Concert for Change"
David Suzuki is coming to give the Symons Lecture at the Confederation Centre on Friday, November 16th, at 12:30PM. This lecture is sold out, and I don't know what else is planned for while he is here. We have been trying through several "channels" for months to let him know about Plan B -- but let's try one last blitz. He certainly has heard the backstory. or just send the original video. and ask him (or his staff) to please contact me (chris2575@gmail.com) or Tony (mcopleston@gmail.com) to arrange something. This may be small compared to oil drilling in the Gulf or the pipelines in the west, but it is *very important* to islanders, especially with our small land base. [bcc mcopleston@gmail.com so we can keep count]. Ask them to please bring Plan B to David Suzuki's attention. There were people at the Info Centre yesterday, and lots of back and forth at Base Camp (Camp Vision). The next time the info centre at the Bonshaw Community Hall will be open will be Saturday, November 3rd, from 1-3PM, downstairs. Take care in the storm! Base Camp is now being called Vision Camp and is still happily peopled, with folks who are preparing for winds and rain. Feel free to stop by! Despite clear-cutting along Crawford's ravine (west on Peter's Road) and the strip south of the Camp, you can still come into camp and walk around the private property (which we have permission to be on) and see what is going on from there. There is information regarding the Complaint Management System for environmental concerns in the trailer. Atlantic Veterinary College, Lecture Room C, at UPEI - Admission by donation - proceeds will go towards efforts to protect the forests, land and water of the Bonshaw Hills. Courtney Starkman's song "Defend our Island: Stop Plan B"
The weekend was a nice time for people to get out and see the beauty of the Bonshaw Hills and the destruction at the Plan B sites (perhaps I shouldn't use destruction and nice in the same sentence, but that's Plan B and the wonderful people opposed to it). There was a lot of fun at Base Camp Saturday afternoon and Sunday many attended a fabulous walk organized by Ron Arvidson in Strathgartney Park; several took the opportunity to drive by Peter's Road to take in the road cut. There are a wonderful revolving group of people living at Base Camp and preparing for this week's wind and rain. Consider stopping by to say hello, pop into the trailer to get a map and get some "Watch Plan B" materials about the Complaint Management System, and see what is going on. Reserve Saturday night, November 10th, for a wonderful concert at the Jack Blanchard Hall on Pond Street in Charlottetown, all for Plan B.
P.E.I. is a small place and like other small places, I think we need to protect those things that make it special. Norway is famous for its fjords and woodlands. The Netherlands has its canals, windmills and fields of tulips. Switzerland has the Alps and alpine meadows with chalets overlooking peaceful valleys, lakes and rivers. On P.E.I. we have as much treasure and world-class beauty in our rolling hills surrounded by water and our fields, hedgerows and what's left of the Acadian forest. The delicate genetic diversity is what gives P.E.I. its colours and natural beauty. Is it wise to bulldoze through these hills - as in Plan B -and cover another area with asphalt forever destroying a piece of what we have left? During work on a renovation project in Ireland, the driveway and the stone wall through which it passed needed to be moved several meters on request of the Dublin city planning commission so that traffic would not pass over the roots of a large cedar tree growing near to the existing driveway on the homeowner's land. Another time while hiking on Mt. Rigi in central Switzerland, I was amazed at the number of cowbells I could hear. It was spring and the cows were being herded up to alpine meadows for summer grazing. I was unaware to what extent this old practice continues in modern times. A few weeks later, a late winter storm swept through that part of the country. Stranded cows were airlifted by helicopter to lower ground to prevent them from dying. The milk or cheese produced by a cow in a lifetime would not pay for a helicopter ride, but that's not the point. These are examples of how strongly the people of those areas believe in protecting the part of the world they have inherited and working to maintain it into the future. I believe it's time we give up on the antiquated idea of bigger always being better. We need to value what we have, what makes us unique and be good stewards of this beautiful little island. And on we walked, and talked about regeneration, and what a forest community really is (not a monoculture of 13,000 trees), and that maybe, just maybe, being a tree-hugger is not a bad label for anyone; in fact, it's what we should be called if we figure out how to live on this earth and raise children who are going to take care of it. He also encouraged all of us to come out, enjoy what *is* here, and witness how the project is being handled, what happens, and call-out at the first signs that damage is happening. It was a beautiful day and lots of people got to share fresh air, fields and woods, knowledge and encouragement, and companionship. If you are interested in helping us decide if when to have the Bonshaw Community Centre open for information about Plan B, please fill out thiquick Doodle poll today. Thanks. Consider trying it out for a little donation, and / or telling friends about it. Please keep in mind we are NOT a registered charity, so we cannot issue tax receipts. And it is a beautiful weekend, Peter's Road is open, so come out and see the areas. Fairyland: some buildings (the justification for the higher price paid for this property) were demolished and earth-moving continues. Hemlock Grove: the stream has been "diverted" to one side around the island, near all the land that was cleared almost two weeks ago. Peter's Road: tree-choppers continued to clear on both sides of the Peter's Road. You can still get to Base Camp, which is up Peter's Road almost a kilometre, right turn onto private land. Crosby Road: No real idea, since you can't see it from the road. From Green Road you can see they are accumulating shale in piles. Come out and see what's going on. Concerns can be addressed through the Complaint Management System, so bring a notebook and a camera. Today, please meet *before* 11AM at the Strathgartney Overlook, which is right next to Strathgartney Provincial Park (the park is closed to motorized vehicles). We will figure out where it is safe to go, and head out. Gary Schneider of MacPhail Woods is leading. Sunday, 1PM, meeting at the same place, a Walk with other naturalists on hand. We are hoping to open up the Bonshaw Community Centre (off the TCH off Green Road) a couple of times a week for an hour or two so people can visit the Plan B information centre, have a cup of tea, look at maps and get directions, learn about the complaint system, and chat with others. To help us figure out when would be useful times to have the centre open, could you "vote" quickly in this Doodle poll? Could you answer today or tomorrow? Thank you. Hope to see you on these walks, if you can make it. If not, we know you are supporting the opposition to Plan B, and you realize this is becoming more than about the highway. Gary Schneider from MacPhail Woods is coming our way for a walk tomorrow, Friday, October 26. We are meeting between 10:30 and 11AM at the Strathgartney Lookout, located next to the Strathgartney Provincial Park. At that point we will decide the best places to go, depending on what's available near the construction zones. We will see a lot of what we have lost, but what's left. The walk goes to about 12:30. I think we will talk about the complaint system for the public, too. Here is the facebook link. Ron Arvidson has planned a birding and more walk around Strathgartney on Sunday, October 28th, from 1-4PM, also meeting at the Lookout. Jackie Waddell from Island Nature Trust will be there, and there will be lots to see. OK, so it's not hard to find media stories about Plan B. Yesterday was a well-coordinated blanket of media coverage from our Transportation people on the costs of the security. It does seem rather pathetic to "blame the victim". Tuesday was a very well-done piece by Pat Martel at CBC radio, interviewing the three women who were actually there at 4PM Friday, October 12, the day of the RCMP raid on the Hemlock Grove. It clarified some misconceptions in the Guardian article, and encouraged RCMP spokesperson Corporal Blackadar (who wasn't down there at the time, either) to straighten out the inaccuracies. Well done to the women who stood up to all that, and to the media and police to answer to their misleading statements! I hope the members of the CBC political panel were listening, too. The letters in the Guardian have been a bit uneven, but Sarah Saunders from yesterday is the best clarification ever. In his column Oct. 20, Rick MacLean is giving more organizational credit than is due to Plan B opponents.To imply that such a diverse group of people are somehow acting with one mind is absurd. To give the impression that people involved have the time, energy and desire to cohesively organize this type of media strategy is very naive. There is a diverse and wide range of people opposing this project. People come of their own accord, speak and act in a range of ways based on their own conscience. The only organizing force that's steering this is common sense and civic concern. These are our neighbours and friends who care enough about what's happening to speak up. He may like to think we're all out plotting photo-ops but in fact, most of us just want to get home and do some laundry. CBC Radio is broadcasting an interview in about ten minutes with the women who were there when the RCMP were called in that Friday afternoon. Yesterday was an interesting day: Such bravery shown by the women in the trees. A very symbolic gesture, in the face of a government whose arrogance is extending down to the people on the ground enforcing the project. While we watch the Crawford's maple and birch stand get ripped up, we are looking at our few avenues of public comment. We can participate in the Environmental Protection Plan -- it's part of the process that the public has the right to comment and have their comments addressed. With its usual logic, these environmental concerns are handled by the Department of Transportation. They *have* to investigate concerns submitted from the public. If they don't, then they are not following the process set up for them, and in violation of Minister Sherry's conditional approval of the project. The gist is that since Minister Sherry's Conditional Approval of the project on October 1st, and environmental concerns can be written or called in and need to be addressed. Major concerns like sediment in a particular stream, and ones like noise from the site, mud on the roads, etc. can and need to be submitted. This is the process set up for the public, and perhaps they are hoping we never found it and won't use it, but it is there and their compliance is part of the conditional approval of the Plan. So please read the document on the website that describes the process and how to frame your concern. They have set up a phone number 1(902) 675-7490 and an e-mail (gateway@gov.pe.ca -- how nice of them to reuse this e-mail address), which is for the public to call and ask about the process, so please do. I am so worried about the beautiful forest heart of P.E.I. being ripped out by heavy machinery. While the Ghiz government wants to justify this atrocity, everyone knows this route is just wrong. What is also a worry is a government that cannot come up with the solution. There are alternatives, but the Ghiz government has blinders on. This is frustrating to people with genuine concerns for P.E.I. If the Liberal government is capable of destroying the beautiful old-forest heart of P.E.I., without regard, I worry about what is next to be rammed down our throats for our own good. What an interesting week at the Peter's Road base camp! The Warrior family of Chief Peter Bernard and his wife, children and grandchildren left Sunday morning. The sacred fire was blessed, and as it has been more than seven days, it can go out. Despite the media hype and inaccuracies, the group was here of their own accord and to assess the situation according to their cultural beliefs. This weekend many people stopped in to chat with the campers and to head out to see either the hemlock grove area or the Acadian forest to the west of Peter's Road (the steep ravine with maple and birch). There is tree-chopping equipment parked west of the area, so it's obvious the Province intends to continue its inexorable march through Island forests to cut this road-line. How ironic it is during what is the peak of Fall colour. For the time being we have stopped asking people to be sign-wavers on the highway by the Cameron Road construction entrance. With the installation of guard rails and mud and gunk all over the road, plus constantly moving equipment, it's not easy to drive on this stretch. The beautiful hillsides contrast too much with the sickening devastation on either side of you. An interesting media day Friday, as the Hemlock seedling rally was filled with comments from parents, children, and grandparents urging government to make wise, longterm decisions; the media focused on histrionics. And I would like to mention the passing of one of the New Haven-Riverdale patriarchs, Oliver MacDonald, who lived with his wife in the little yellow house right by Strathgartney. I only met him a few times, but he was a kind and gentle man, and I am sorry for how this road and the purchase of his house must have affected him and his family this last year. Sorry we have been slow to get the user-friendly forms out. This "Complaint Management System" is the process in which citizens can lodge complaints to the government regarding environmental concerns -- it's our opportunity to "Watch Plan B", submit short descriptions of problems, and request information about the resolution of environmental concerns during the construction. Although not permitted on the actual construction sites, people can still be in the adjacent areas and see what effects are taking place -- especially after rain. And more information to come this week as we deal with bad choices our government has made -- more in tomorrow's update. For months I have been reading letters and commentaries in these pages in opposition to Plan B. I mistakenly thought that the volume of letters and commentaries (as well as other initiatives) from both individuals and organizations would be heard and respected by government. Many of those writing expressed well-reasoned and compelling arguments revealing how ill-conceived the project is and how flawed the process has been. The government's assertion that its only concern is the safety of Islanders has a distinctly hollow ring. Many of us just do not believe that this is the primary driving force behind this project. The revelation of questionable practices with respect to accident statistics and the causes of those accidents is disconcerting. Over the months, as I read the letters, I watched the left-hand side of the page for editorial comment. I have been disappointed. In a democracy when government fails to listen to the people, traditionally a free press is an ally in that struggle. The subtitle in your Oct. 4 editorial states: "With no environmental damage expected, why would the province not proceed?" Has the editorial writer not been reading the paper over these months? The environmental damage of this project has been more than adequately - and expertly -spelled out. You are aware that it is the government's environment department that has given the go-ahead to the project. Obviously, their assignment was to find the means of justifying proceeding with Plan B. So all reasoned arguments have fallen on deaf ears and the last resort has been to be at the site in a last-ditch attempt to demonstrate that an irreversible mistake is being made. Those committed protesters are enduring wind and rain not for any personal gain but because they care deeply about our Island. Their efforts are appreciated. You know, this whole Plan B thing is more than just about destroying P.E.I. 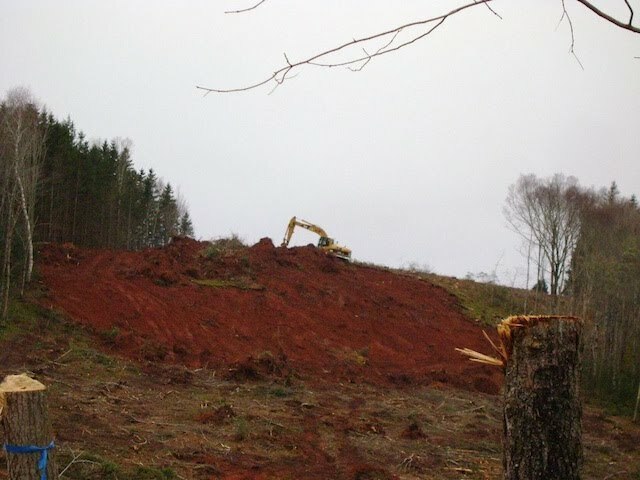 's last remaining old-growth forests, trampling on democratic discourse with citizens, wasting precious resources and driving Islanders further into debt, prompting more severe austerity measures, cutting social workers etc. It's a flashpoint for a growing anger over many years for the complete lack of understanding of how valuable our land resources are: look at nitrates in tap water, putrid green rivers and stinking bays, deep water wells, massive soil erosion, high rates of asthma in Island children, weird and high rates of cancers in the province, hundreds of thousands of trout and salmon in 30 major river kills and on and on and on. This all has to stop. They may have cut down the hemlocks but they unwittingly have set forth a lasting anger and set alight a sacred fire in us all. Change is coming to Prince Edward Island and the real battles over the gift of land we have been given has just begun. I thank the Bonshaw hemlocks and their 200 years of life for this opportunity. Definitely go by the hemlock site and see what's going on. You can see what's happened since the last time you were there, and realize that it's not just about a couple of hemlocks in the way -- a whole chunk of forest ecosystem was razed, and is slated to be filled 60 feet over your head when you are down there. Go up Peter's less than a km, and turn right at the first "driveway". Park on the hill (it is a little muddy due to the rain), say hi to anyone tending the fire and "upper camp", and head down the road/path to the water --you have to follow more of a footpath towards the end. It's definitely sloppy, so wear boots. There is a snowfence to keep you "safe" if there is any construction going on down by the hemlocks. You can sign up to hang-out at base camp, stay overnight, or definitely to wave signs for a two-hour shift on the highway. Please contact Megan Burnside <burnside.meg@gmail.com> to see when she needs you. Usually, there are a few "experienced" people there to give you a lesson on sign-waving and safety (it is all about safety, eh?). If you can make new signs, that would be appreciated, too, since the originals are getting a bit bedraggled. Just don't put a stop sign image on a sign -- it makes the police jumpy. Please include a contact phone number so the editor can verify you wrote it. This is what we dug up over the weekend. Concerns? You can call TIR, or fill out the form (which we pulled out of the Environmental Protection Plan) and send it to them (scan and pdf, fax, or regular mail). They should be responding within a couple of *days* -- so follow up with them!